This is a case study to show how school grounds maintenance can have a positive effect on a child's education. 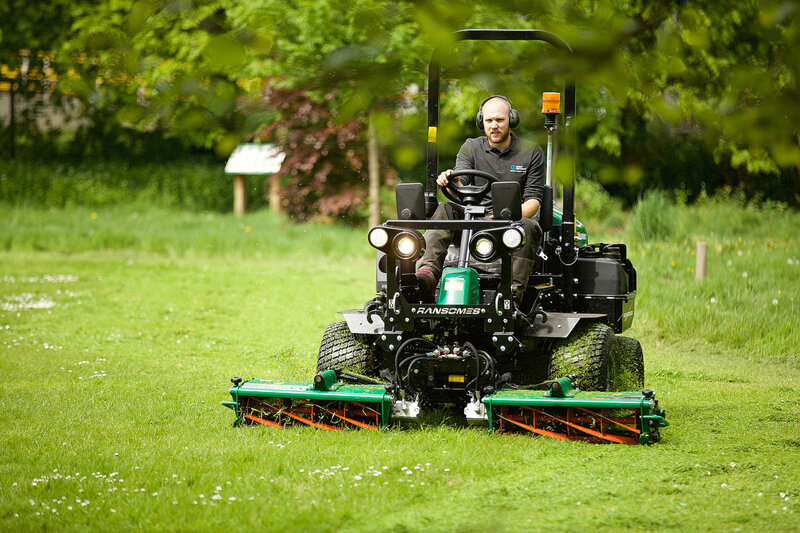 Great Grounds are school landscape and grounds maintenance specialists and have children’s social, cognitive and physical development outside the classroom at the core of its ethos. We specialise in installing and maintaining school outdoor areas, particularly those that promote learning in a fun and safe environment. With all our landscape and grounds maintenance contracts we provide free workshops and demonstrations linked to curriculum expertly delivered to the children in primary schools. Take a look at another of one our case studies successfully demonstrating how children can learn in new and exciting ways. Her Majesty’s Chief Inspector of Schools says, "The benefits of Outdoor Education are far too important to forfeit, and by far outweigh the risks of an accident." The demonstrations also provide a good way for children to develop their verbal communication by using new vocabulary; in addition, Latin names of plants will be used encouraging them to expand their vocabulary and learn about new languages. The positive outcomes for the demonstration have been shown in our open days held at Sacred Heart R C Primary School and Great Grounds Education Centre. 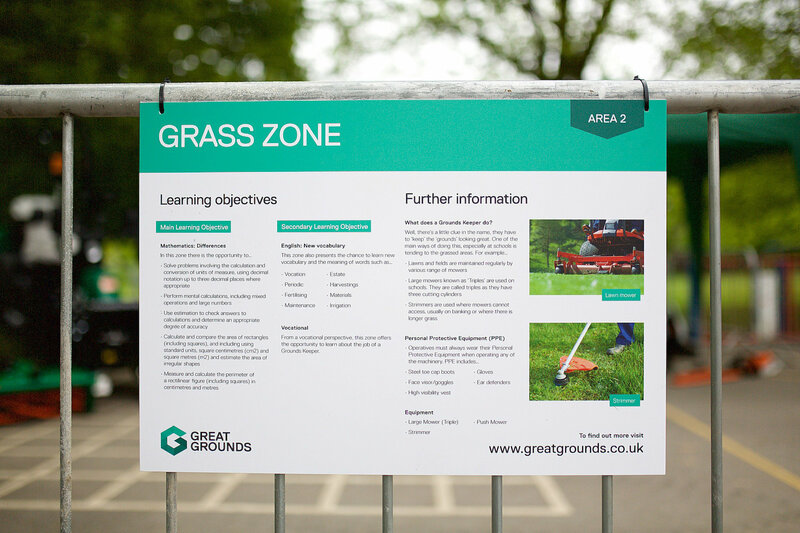 The Grass Zone, where we looked at the work of a Green Keeper or Gardener and what their job entailed, specifically based on grounds maintenance within the school grounds. We asked the children about the personal protective equipment (PPE) in this area and what they needed to protect themselves. Next, we discussed some of the tools used by the green keeper such as large triple mowers and small hand pushed mowers then discussed the differences in size of equipment required for each type of job. We also discussed the difference in weight and the effects on the environment between the petrol and battery powered strimmer’s and blowers. Here we linked the demonstration to measurements between the mowers and the area each could cut and how long it would take them to mow a certain area. • Introducing children to apprenticeships and to help pupils make a connection between what they learn in the classroom and how it relates to the world of work. • Connecting children to nature linking to geography, maths, science and history. • The children also learnt about health and safety and the equipment workers needed to keep them safe whilst working. • Linking what was being demonstrated to the curriculum in school. This provides the children with a real-life link back to work they do in the classroom. • Engagement of the children who sometimes have a hard time concentrating in the classroom. • The demonstration was mostly hands-on and practical which engaged all the children. 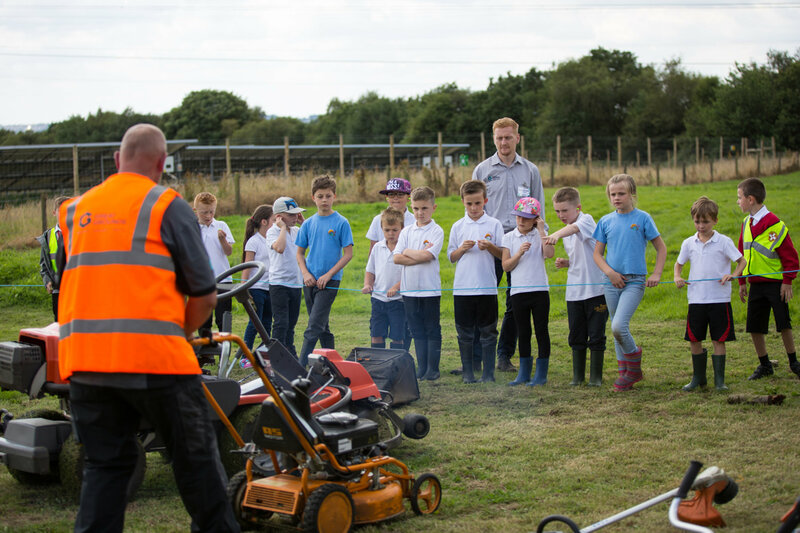 Another great addition to our grounds maintenance workshops is empowering children. Allowing children to plan areas of their environment for nature reserves etc, with the help of our specialists this can empower children, allowing them to take ownership of areas within their school grounds. The fastest way to empower children is to make their work matter in a real setting. By creating an environment where their efforts will impact on other people in a positive way, you can help children recognise the tremendous influence that they can have. Teachers can promote active and independent learning that enables pupils to think for themselves, helping them to plan and manage their own learning. 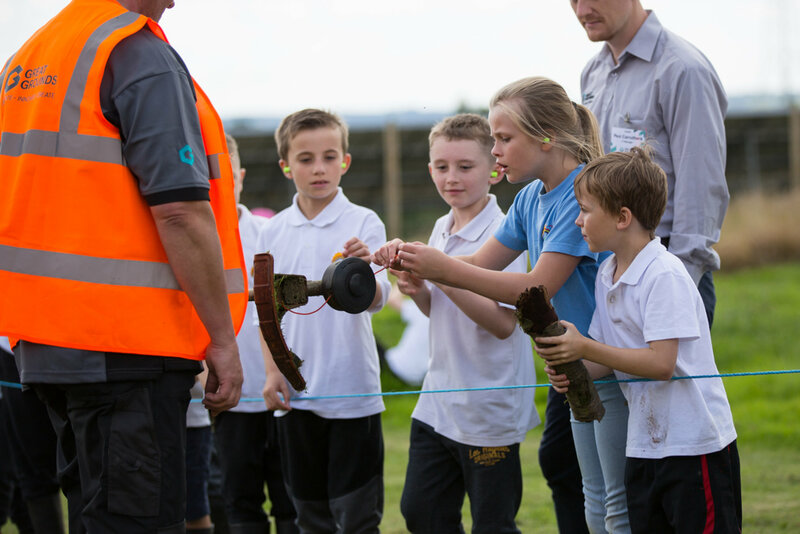 If the schools are fully involved in the planning, maintenance and planting process within their school grounds, children can also discover the skills needed by people undertaking these jobs, such as a garden designer, green keeper and landscape gardener.